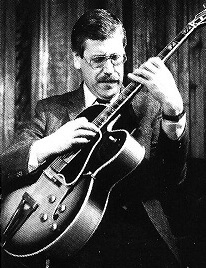 Guitar player Louis Stewart was born in Waterford, Ireland in January, 1944 and having learned to play piano as a child he switched to guitar at the age of fifteen. He played with a number of show bands in Ireland and in 1961 toured the US with sax player Jim Doherty's group. He also won an individual award at the Montreux Jazz Festival. In 1968 he moved to London to work with Tubby Hayes in his quartet and big band until 1969 when he made the first of three European tours with Benny Goodman. From early 1970 he made Dublin in Ireland his base before returning in 1975 to work with Ronnie Scott. He worked regularly with Ronnie Scott until 1978 before he began a long musical association with George Shearing that included extensive touring, including South America. He then became a very successful international freelance, using Dublin as his base, working in Australia, US, Scandinavia and elsewhere. During the 1980s and '90s he led his own groups in Britain and at many international festivals, working with George Shearing again in 1995. He worked through the 2000s playing solo dates, guesting with top groups and other freelance work. He has recorded regularly although a number of his albums recorded outside of Britain are not currently available. He died on August 21st, 2016. Tubby Hayes (ts), Louis Stewart (g), Kenny Baldock (b), Spike Wells (d). Greg Bowen, Ian Hamer, Les Condon, Kenny Wheeler (tp), David Horler, Bill Geldard, Chris Pyne (tb), Peter King, Alan Branscombe (as), Tubby Hayes, Ronnie Scott (ts), Harry Klein (bs), Mike Pyne (p), Louis Stewart (g), Ron Mathewson (b), Spike Wells (d). Jeff Clyne (b), Tony Levin (d) added, rest the same. Ian Hamer, Les Condon (tp), Kenny Wheeler (flhorn), David Horler (tb), Peter King (as), Alan Branscombe (p), Louis Stewart (g), Jeff Clyne (b), Spike Wells (d), Tubby Hayes (ldr). Louis Stewart (g), Peter Ind (b). Body And Soul*/Everything Happens to Me*/Free For Two*/Baubles, Bangles And Beads*/Loverman*/Gone With The Wind*/Autumn Leaves*/Angel Eyes*. September, 1975 - Hawk Jazz SHALP147 recorded in Ireland. The album was titled Louis The First and the group personnel was Louis Stewart (el-g), Martin Walshe (b), John Wadham (d). The album was not released on a UK label. Geoff Castle, Martin Blackwell (keyboards), Louis Stewart (g,keyboards,synth), Ron Mathewson (b,el-b), Martin Drew (d,perc). (There is an unidentified soprano sax in the ensemble of Araby). Araby/Eveline/A Little Cloud/Two Gallants/Bolivian Tango/Pavane/Con Alma. August 15th, 1979 - Livia LRLP5 recorded live in Dublin, Ireland at the "Peacock Theatre". The album was titled Alone together and the group personnel was Louis Stewart (g), Brian Dunning (fl). The album was not released on a UK label. John Taylor (p), Louis Stewart (g), Sam Jones (b), Billy Higgins (d). I Thought About You/Litha/Smiling Billy/Unit 7/November Girl/Straight No Chaser. May, 1986 - Villa VRLP001 recorded in Oslo, Norway. The album was titled Good news and comprised nine tracks by Louis Stewart & 4Sure, a Norwegian group. The album was not released on a UK label. August, 1988 and February, 1990 - Villa VRCD003 recorded in Oslo, Norway. The album was titled String-time and comprised ten tracks by Louis Stewart and bass player Terje Venaas. The album was not released on a UK label. Louis Stewart, Heiner Franz (g), Fritz Heieck (b), Thilo Berg (d). Almost A Simple Blues*/Like Someone In Love*/Winter Song*/I Should Care*/Bluesette*/Just In Time*/Joy Spring*/Chelsea Bridge*. Louis Stewart, Heiner Franz (g). In A Mellow Tone*/Jive Hoot*/Blue Daniel*/Just Squeeze Me*/Nica's Dream*/The More I See You*/Star Eyes*/There'll Never Be Another You*/As Long As I Live*/In A Sentimental Mood*/Triste*. September 5th, 1992 - Villa VRCD004 recorded in Sandvika, Norway. The album was titled Joycenotes and comprised tracks by a nine piece group directed by Louis Stewart who also played guitar. The album was not released on a UK label. Louis Stewart (g), Ronnie Rae (b), Tony McLennan (d). All The Things You Are*/Lady Be Good*/Polka Dots And Moonbeams*/Oleo*/Yesterdays*/Stompin' At The Savoy*/Body & Soul*/Walkin'*/My Shining Hour*. Louis Stewart, Heiner Franz (g), John Goldsby (? ), Oliver Strauch (?). This page was last updated during December, 2016.